I had a long list of books to read this summer and they were all fiction. Chaser by John W. Pilley. I couldn't scoop this book up quickly enough! Did you see Chaser on Nova or 60 Minutes? My husband and I were lucky to see both of those shows and Chaser mesmerized us. If you've ever loved a dog you should read this book. precious dog with his knowledge of science. Chaser knows over 1,000 words. She also understands phrases and categories. Chaser shows us just how smart dogs can be! Dr. Pilley sets the finest example of gentle love for an animal. You will learn about dogs, language development, play, and so much more. Honestly, you can learn about child development by reading this book. This is NOT a how to train your dog book. It's so much better than that! When I was teaching, one of the kids' favorite stories was the book, Martha Speaks. It's about a taking dog. It was a great story, pure fiction, but the premise is one we have all dreamt of as children. This seems like the real life version...must check it out! How interesting! I haven't seen anything on this or heard about it, but will definitely check it out! Will add the book to my list! How cool!! Thanks for the recommendation! At times I feel like I cannot fits book into my schedule…my eyes are so tired at night. Then other times,I get on a reading roll sand cannot stop! Hoping this is a reading fall and winter! Where have I been? I have not seen or heard of Chaser! He is certainly adorable and evidently brilliant.LOL I'm on my way to the website! I've not heard of this book either but I know I would enjoy it! I'll look for it! Hugs! Wow! 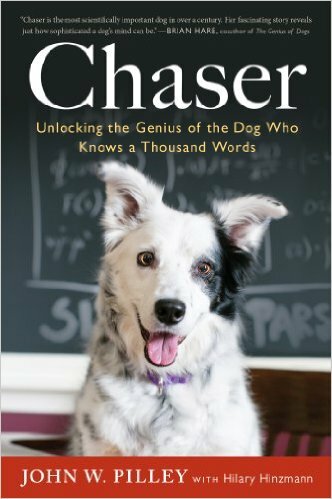 I've heard all about Chaser because we live in the same town and my daughter (as well as several other family members) graduated from Wofford College but I never considered reading the book! You've certainly sparked my interest now so I must get the book and read it!! How have I never heard of this book? I love books about animals and this sounds like a winner. Have you read the book about Dewey the library cat? That was a good one too. I have not heard of this book or that dog! It sounds like a good read for sure. I have a dog so I bet I would learn something from it. Thanks for the suggestion. Stacey, it sounds wonderful and yes, I have loved a dog....thanks to the wonderful encouragement of my darling husband. He worked with me for twelve years to allow dogs into my life. I was raised to not like them. How they changed my life. I am so glad God allowed me to know this kind of love. Thanks for the review. Hope your weekend is blessed. Aren't border collies supposed to be the smartest breed? I love border collies! :D This book would definitely interest me because I love dogs so much. I don't know how I missed this story on 60 Minutes because it's Trip's favorite show! This sounds awesome, Stacey---I'll have a look at Target. Very interesting. We are all dog lovers in my family so I can pass it on. On a fictional note, I read a book called Einstein a few years ago. It was about a sort of a cad who dies and comes back in the form of a dog at an animal shelter where his mourning wife works. She adopts him and it's all about how she navigates life without the husband although he's 'sort of' there. Funny and sad, I bet Amazon has it. Can't remember the name of the author. Einstein is the dog's name. Chaser is new to me and sounds like a fascinating dog. I'm visiting from Literary Friday. Thanks for this great review. I'll have to add that title to my list because I do have a deep love for dogs and cats. I just finished reading Gathering Shadows by Nancy Mehl which was a really good inspirational story. This sounds like a fantastic book Stacey. I DO love my doggies. It's always nice to get a book recommendation!!! I read the other comments and gleaned a few more!! I just pinned the book onto my Pinterest reading board. I am amazed at the vocabulary Lulu has and I love books about dogs. I haven't heard of the book, either. I think animals are much more aware of us than we give them credit for. I'm not a pet person, but I still think there is a connection. Kind of interesting, for sure. I love my dog and will check this book out! I loved this! Thank you, Stacey! I've never heard of Chaser, but this looks like an interesting book. I'm always interested in learning more about dog behavior. I have two beloved dogs of my own and I'm convinced they understand much of what I say and I know I've learned to understand much of their 'language' (yowls, barks, body posture, etc.). Just finished reading this book after seeing your recommendation, and I really enjoyed it. Thanks!